She’s your go-to woman when you need a helping hand, advice, and support. In her eyes, you’re perfect, even when you dump her with an overloaded laundry basket or talk her ear off with your latest soap opera drama. Mother’s Day is the perfect opportunity to give back and let her know how treasured she is. What better way to touch your Mum’s heart than through her taste buds? Sure, you could whip your Mum up breakfast in bed with a handmade card on the side. It’s incredibly thoughtful but just picture that pile of dishes, slightly soggy bacon and a lukewarm mug of instant brew. Kick off your Mum’s special day with a tantalising breakfast prepared by the professionals. Head down Darby Street and spoil her with a champagne breakfast from Autumn Rooms or a classic Three Monkey’s feast. Devour artisan crumpets with a view at Estabar. The café will be hosting photographer Lee Illfield from 9 to 11am, so you can grab a free snapshot of the special day. Soak in the Newcastle harbour sunshine at Honeysuckle Hotel, they’re hosting a buffet breakfast from 8 to 10am (tickets available online). Bringing a tribe of little ones with you? Book online at Blue Door for 7 or 7:30am and the kids eat free. 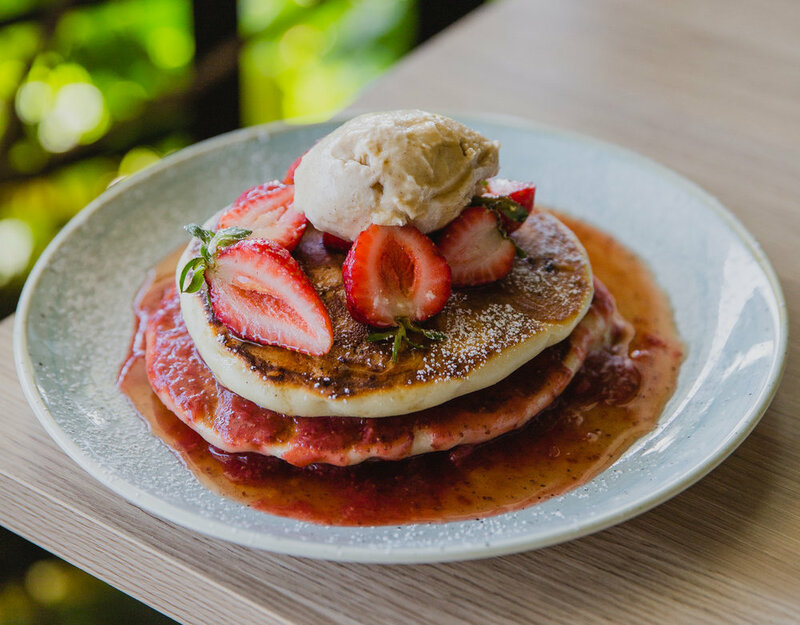 Whether she’s craving eggs benedict, a nourishing green bowl or pancakes loaded with tantalising trimmings, Newcastle’s cafés won’t disappoint. She’s the queen of the household so you better treat her like one today. What better way to spoil Mum than with an intricate high tea of royal standards. Head to The Tea Collective for freshly baked scones, house-made jam, and lashings of whipped cream. Indulge her inner chocoholic at Coco Monde. The elite chocolateria serves an extravagant array of fluffy marshmallows, flaky pastries, and hand-crafted molded chocolates. Overlook Newcastle’s stunning beaches while you sip champagne and nibble on petite finger sandwiches at Merewether Surfhouse. Escape the city and relax in the lush Hunter Valley vineyards. The nostalgic Convent will transport you to the roaring 1920’s with their Gatsby inspired décor. Their tantalising high tea menu features decadent sweets like macarons and eclairs. Raise your pinkie while you sip tea at Sabor Tea Room. The patisserie is renowned for their delectable desserts, so you’ll be served luxuries like passionfruit crème brulée. Just because your Mother’s Day looks more like a family reunion than an intimate affair, doesn’t mean you can’t dine out. Foghorn Brewhouse has room for the whole gang and will be serving $5 bubbles and mouth-watering smoked meat platters all day. For a feast to satisfy the whole family, head into MEET and devour traditional Brazilian churrasco, Mum will even be treated with a glass of sparkling on arrival. Stroll along Honeysuckle wharf then lunch at Queen’s Wharf Hotel or Squire’s Maiden, your Mum will receive complimentary bubbles. For a menu that will tempt the fussiest eaters and a space with plenty of room for the extended family, check out The Lucky, The Grain Store, The Edwards or Parry St Garage. You might not be able to spoil her with her dream holiday, but you can take her taste buds on a culinary journey. Dance the salsa at Bocados with their Spanish tapas and tantalising banquets. Transport her to the Mediterranean at Rustica or smash plates at the Greek Taverna. Explore the subtlety of Japanese cuisine at Nagisa, Kitami or Susuru. Pop on your best sombrero and head to the newly reopened Antojitos or Beach Burrito Company for lunch with live music. Looking to escape the bustling restaurant scene and get out amongst the great outdoors? Treat Mum to a picnic on the beach or by the garden at your local park. Swing by Doughheads on your way, their latest menu features Lemon Meringue, Strawberry Champagne and the sugar coma inducing C-Bomb. The overloaded doughnut is dipped in cookie dough icing, drizzled with sticky caramel, pumped full of whipped ganache and topped with chunks of cookie dough. Skip the line at the florist and treat Mum to a bouquet from Cupcake Espresso. You can order a box of their pastel, Mother’s Day cupcakes topped with an elegant rosette of luscious buttercream. If your Mum has a sweet heart but not a sweet tooth, spend the morning strolling around Newcastle Farmer’s Market and fill your basket with wholesome produce. Pick up an aromatic Baked Uprising baguette and pair it with creamy, local cheeses and freshly picked fruit. Rug up and picnic under the stars at Lambton Park’s Five Senses Twilight Market from 4 to 8pm. You’ll have your pick of delicious food trucks like Newy Burger Co, Choux Patisserie and Bao Brothers. Create your own degustation menu and share a plate from your favourite vendors. Sure, you could grab Mum another candle and pair of slipper this Mother’s Day, but what she really wants is to spend the day with you. Spoil her with your undivided attention and a delicious feast. She’ll end the day with a full belly and a full heart. Mother's Day is one of the busiest of the year, so where you can, thank your serving staff and make sure you make a booking!